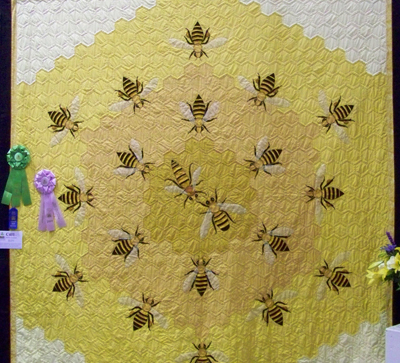 I've been busy as a bee and almost forgot to tell my readers, The Vermont Quilt Festival is this weekend! It is an annual event for me since discovering it several years ago. For more information visit their website : Vermont Quilt Festival or call 1-800-872-0034. Definitely rearrange your schedule to take it in! You won’t regret it!! 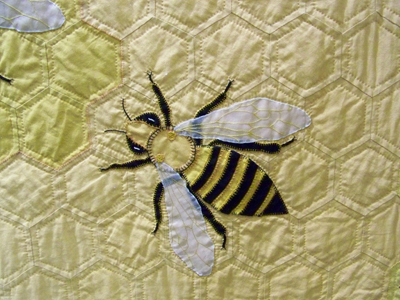 Close-Up of "Honey, I'm Home" Quilt was started in 1986 and completed in 2009. Honeybees are rendered in correct proportion to each other and have physical characteristics particular to the queen, workers and drones. The wings are made of silk organza and hand embroidered with Sulky thread. This event is a big deal! It will be a feast for your eyes to be sure!! It is New England’s oldest and largest quilt event!! Exhibit entries come from all over the US, Canada and abroad. Featured are Special Events, classes with experts in the field, appraisals, awesome vendors and vendor demonstrations. Don’t forget your camera, but respect their photography rules of personal use only and if posting to websites crediting the artist(s) is critical! Do plan on wearing comfortable walking shoes, or rent wheel chairs for those with walking issues. I take the day before and after to rest up for and after the event! Plan on taking the whole day if you can. If you can’t, the entry fee is still well worth even two-three hours of viewing pleasure and be sure to pack a small snack in your bag. There is a food pavilion to sit a spell, rest your feet and re-energize yourself! It is amazing to me every year that I seem to be like the Ever-Ready Bunny when it comes to this show! It is so delightful that your body won't cry, "Enough!" until you collapse in your car to return home! This event alone, is enough to stimulate your creativity for the entire year! It will make you proud to see what is privately created by infamous folk artists like yourselves! Of course famous quilters will be there too! Don't miss it! !